ARUN PADAKI writes: Just as Mysore begins to unwind after nine hectic days and nights, a shocker from the Mysore City Corporation. Two hundred and one, yes 201, trees on some of the best avenues of Mysore will go chop, chop, chop if MCC has its way. Unofficial reason? You work it out. 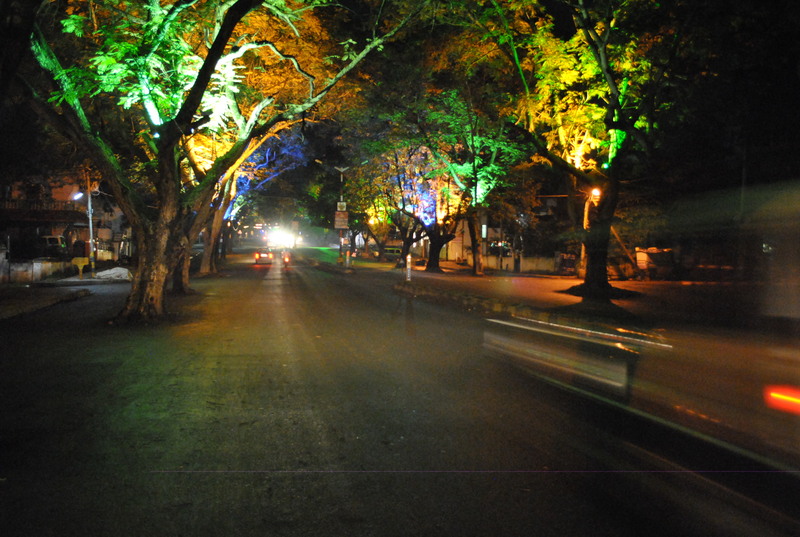 The quaint avenue trees on Vani Vilasa Road leading upto the law courts with coloured lamps on the trees, pictured during the Dasara a week ago, will be a thing of the past. This entry was posted in Issues and Ideas, Mysore-Bangalore and tagged Arun Padaki, Churumuri, MCC, Myosre City Corporation, Sans Serif, V.V. Road. Bookmark the permalink. That’s sad to hear. Let Mysore not become another Bangalore. They have destroyed so many beautiful tree lined streets and circles in Bangalore in the name road widening and flyovers. What is the use of this kind of ‘ development ‘ ? This is a man made epidemic by our half baked, uneducated, devoid of right knowledge MLA`s/MLC`s or Poura councillors. Routine indiscriminate licensing of commercial activity in a particular major or even residential road for a usual consideration increases transport activities in huge proportions. This will necessitate road widening in which trees get cut & the part of a residence in the road will have to be put on chopping block. Actually this is happening in all the cities of the country. Thus what starts as a greed for consideration fee to Poura councillors for licensing commercial activity on roads will end up as a man made epidemic of gigantic proportions. Why are we letting the fate of our cities into the hands of avaricious nincomphoos who are killing nature & man kind. Oh, No! They uprooted trees on JLB Road, promising new ones. Nothing have appeared there so far. What is the ‘Tree court’ doing? I think 70% of the people in Bangalore use either public transport or the transport provided by their employers/schools/colleges and they are the ones who have been looking forward for “this kind of development”. Its ought to be a money making schema. As I notice, it has been taking place all along the not so busy Shimoga-Hanagal road upto 100 km… upto Anavatti. Its happening along all most all roads in Karnataka I suppose. I suspect its a mega money making schema between some saw-mill/depot owner and govt officials. ಕನ್ನಡದಲ್ಲಿ ಒಂದು ಗಾದೆ ಇದೆ. ಮರ ಕಡಿಯುವವರ ಬಾಯಿಗೆ ಅನ್ನ ಸಿಗುವುದಿಲ್ಲ ಅಂತ. ಹಾಗೆಯೇ ಆಗಲಿ, ಹಾಗೆಯೇ ಆಗಲಿ. ಮರ ಕಡಿಯುವವರ ಮತ್ತು ಇದಕ್ಕೆ ಕಾರಣರಾದವರ ಬಾಯಿಗೆ ಅನ್ನ ಸಿಗದೇ ಹೋಗಲಿ. ಇನ್ನೇನು ತಾನೆ ಮಾಡುವುದು. Yes, it is an epidemic. I hear from my friends that this epidemic is spreading in every city. The socalled, Cosmo, Metro, A class, 2-tier, 3-tier, B type, C type, so on so forth. Who knows in another fifty years. there will be no tree in any part of the country and then probably, there will be a deluge and then a new word may emerge! But it is very very sad indeed. A picture is being portrayed that after road widening, all the traffic woes will vanish and the people will live happily ever after. From one coner of the city or town to another corner, they will be able to travel just in few minutes. Why our policy makers do not realize how false and deceitful it is. Even after all the widening, broadening, the situation will remain just like now. I remember a cartoon by R.K.Laxman few years ago. A person pointing towards a flyover says – ‘This flyover was built to ease traffic, another flyover was built above that flyover to decongest the traffic on the flyover…..
Easy targets, right!! Blame them for everything…..
No sarcasam, 1) a different POV, 2) disappointed with middle class self righteous sanctimonious comments. Just see Mahesh’s comments, I dont understand how road widening makes the present govt. corrupt. In every BDA locality, most the residential plots which are on the main roads are converted into commercial buildings. Every 60,80 or 100 feet road is a high street now, the whole Bangalore looks like it belongs to shopkeepers. What was the primary purpose of these plots, I guess it was affordable housing. Can the govt. reacquire these back (whole plots not just part of it), because the primary purpose is not valid anymore. Has anyone watched this movie’UDHBHAVA’ ? Isn’t transplanting the trees an option? @DailyBread you would die of a choked lung if you had your way. BTW, middle class elites is an oxymoron. Dead treas are bad irrespective of the city. But would anyone agree they are contributing to the death of the same tree one wants to cry over? While its true to an extent of usage of public/office transport while commuting to work, but there are more people commuting alone in their fossil fuel powered motorized vehicles that necessitates the “deforestation” of a city ? While one “wants” the comfort,luxury or need for a temperature controlled enclosed chariot to travel and at the same time, road has to be free of traffic jams and green trees around. The luxury of “and” is lost, its time for “or” . broader pot holed roads or green trees? I guess the choice has already been made, its irreversible. Only if tress could speak or protest! so it spread to Mysuru too……. some 800 trees will go from Jaymahal road ..
Agaleekarana is a fact of life. The ever burgeoning population and our obsession with motor vehicles have made it so. Nostalgia is mouthwatering, but it provides no nourishment or tactics for survival. Now let’s turn the palace into a public housing project for the homeless. Tree conservation by transplantation is a routine matter in civilized countries, especially in China. If one has to remove a 20 or 30 year old tree, for whatever reason, one need not chop it down like our nagara palikes gleefully do. They are removed with routes intact with modern equipment and the routes are treated with fungicide to prevent infection during transportation. The roots are treated with IBC just before planting for their rejuvenation. The only hitch is that one should know where it is to be replanted within a week, which requires certain amount of planning and which again will be difficult for our cerebrally challenged administrators. I had the good opportunity to travel on bus from Suzhou city to Shanghai Airport in China. I saw thousands of big trees being transplanted on either side of the highways as well as main roads within the city. Probably the trees came from a place where they were uprooted to make way for a development project. I feel there is no need to expand the existing roads in congested areas of Bangalore and Mysore. Instead, the planners should shift important offices to the outskirts and concentrate on satellite development to get the people out of these rat holes. What I meant was residential roads in most of the Bangalore has been converted into commercial activity places over the number of years. All the govt people connected including MLA`s & Poura councillors get their cuts when such complexes are planned in a residential area even when the very same elected members know that the road cannot take that activity and the 30` or 100 ft roads are not built for that purpose. Inspite of that for a consideration they will do.Look what happened to Koramangala or Indiranagar or Canbridge lay out or Jayanagar or Rajaji nagar or Mantri mall in Sampige road Malleshwaram. Many of such high commercial activity roads has become unlivable. Who is responsible? Licensing authorities. Every thing is done for consideration. There is no way other than enacting strict rules that in residential areas no commercial activity. If Govt has got guts let them enact this! >Isn’t transplanting the trees an option? You write, “Agaleekarana is a fact of life.” But does it have to be? I’d appreciate our cities using creative solutions to solve the traffic problem. Any fool can mow down a tree — or a human — that happens to be in the way of a Scorpio. Someone observed on this blog only yesterday that many greedy people make shops on residential sites along main roads… how about curbing that by enforcing the zoning laws? I bet it would, in one stroke, help solve half the traffic problem in the long term. Town planning theory tells us that residential and commercial areas should be separate in order to maintain any quality of life, but that theory is thrown to the winds because of lack of enforcement of town plans. Again, how about creating and enforcing dedicated lanes for buses to discourage two-wheelers? How about having better bus service, in the first place? Or mandating “lower” speed limits — that is motorists cannot drive below a certain speed? We seem to care too much for show (just look at all of the deceptive lights on the trees when Mysore has 4-hour power cuts for 9 months in the year, including for hospitals), but too little for substance. Yesterday I was reading various blogs from Bangalore. So many people have excellent ideas about the traffic problem… I wondered how many of those ideas get discussed in the MCC or BMMP councils. Agaleekarana should be a last resort. It is too simplistic — and foolish — to pursue as policy. It’s an “epidemic” indeed. We are a people without a worrisome civic sense. Walls and trees invite us to urinate; we cannot resist clear spaces near water, be it from a tap or a puddle. If there is a mandatory national policy requiring planting or transplanting trees and reforestation, government machinery makes money by ignoring it. Shops used to be a rarity except in clearly designated business districts, but now they serrate every thoroughfare, with one or two quietly conducting business even on our addabeedis. They do not want to be obscured by trees. Pan spittle, cigarettes butts, and wraps of all sizes and kinds are the rangoli of our footpaths. For years, I have been crying my jeremiad out in this space: more education. And now “less population.” If China can do it, so can we. The denuded South America, Bangladesh, and many of our own states should teach us a lesson. Special Economic Zones, agaleekarana’s demon cousins, too be damned. How many of you are putting your ‘dead granpas’ on the electric cremetoriums? if not stop your lousy comments. go plant more trees for those chopped ones. replenish and be happy. we need wider roads! “Agaleekarana has been forced to become a fact of life.” in Bangalore. Can BBMP has the got the guts to enact a law under which any commercial activity in a residential area needs signature from three or two)If it is a corner site) of the adjoining owners? Law should be such that without their signatures BBMP cannot sanction any commercial activity! Do Bangaloreans need to force BBMP to enact such a law? Can Churmuri allow me to write a blog on this specific subject or invite people of Bangalore to write a blog to attract huge number of comments which can be submitted to Worshipful Mayor! The best blog on the subject can be selected for appearing on Churmuri. In the comments there will be reserved place for 20nos of logical/meaningful comments from each of the area of Bangalore. For example Nagarbhavi, Koramangala, Domlur, Malleshwaram, R.R.Nagar, Rajai nagar, Vivek Noagar, Indira nagar, JP Nagar, Jayanagar etc etc?. My blog/whosoever writes will contain compelling reasons of why the signatures of three or two neighbours are necessarry to solve many of the present and future problems which are being heaped on us by BBMP members & its employees. How can BBMP avoid future Agaleekaranas? Dailybread, Pl don’t sit in the ivory tower and act like Alexander the Great. Why berate the middle class? To which class do you belong? Upper? or , Higher Upper? . All these socalled developments should reach every class. Not only people like you who say, “get out of our way” types, who think the world should be obliged to them because they are born! Bangalore: Friday 22-10-10- In a brazen misuse of power Mr Vijay Patil Assnt Director of Town planning assults 70 year old Mr Parameshwar Bhat of Pandurang nagar, for daring to oppose illegal construction in the area that falls under Patil`s purview. Worse, Patil was sloshed & he attacked at his home around 1AM. The ilks of such Bangalore town planners have allowed illegal constructions illegally without any bother in Bangalore and such people and Institutions like BBMP have been the primary reason for “Agaleekarana which has been forced to become a fact of life.” in Bangalore. Agalekarana then hits the common man. Why does Agaleekarans arise? Patil like town planners were responsible for creating enabling climate for agaleekarana say 2 decades back at all suburbs of Bangalore for pocketing monies. There is a proverb in Kannada “Kasu Hallu Thaleyu Bolu”! >Pl don’t sit in the ivory tower and act like Alexander the Great. >why berate the middle class? I am not, I am only requesting them to get their priorities right. >All these socalled developments should reach every class. Completely in agreement, no dispute. >who think the world should be obliged to them because they are born! Sir, I am a “nobody”. Ufff!! I am only asking for some proper sadak along with occasional bijli & paani. Note superior, logical, thinking & brilliant minds produce neat, clean, well planned, with simple inexpensive infrastructure, healthy, user friendly cities which does`nt need Agaleekarana. How come all the Indian cities whether it is Bendakaluru, Mysooru, Mumbai, Chennai, Hyderabad, Indore, Hubli, Allahabad, Varanasi, Kolkutta, Hubli, Durgapur, Asansol, Meerut, Lucknow,Ahmedabad are user unfriendly complete with traffic jams! Is it that undeserving, sick and greedy, unintelligent personnel work in municipal corporations in all these cities which produce/plan cities which will become unlivable in @ 25 years from now. Then, our future generation or the grand sons of the present municipal corporation employees will live in unlivable cities where AGALEEKARANA will be the order of the day! Dailybread, every citizen wants good civic amenities. But unfortunately what is happening is mindless and directionless destruction in the name of infrastructure development. Development at what cost? Destruction of ecology? Finally, do you really think after all this road widening, all our traffic problems will vanish?! No. You will see that there won’t be much difference before and after. All these plannings are done by persons with a very short vision. People want permanent solution and at the same time maintaining the harmony of nature. That is not very difficult. People (middle class or whatever class) protest whenever there is mindless and haphazard planning. Indian Middle class is responsible for this mess. With 5-6 % average GDP growth for 12-15 years our cities are coming apart at the seams.To begin with lets ask questions like who designed all these cities. The best and the brightest among the middle class went to colleges, got jobs in govt depts, created these messy cities. The best and the brightest from middleclass could afford sites and loans(+bribes), they built their houses where you cant even park a car ( all of them are parked on the road 24 hrs of the day covered with ugly plastic covers). I work in an industrial area in the middle of Bangalore city which was concieved 30-40 years back. We have tarffic jams whenever two autos come from opposite direction. Who do you think designed this road-someone from Middle Class. Govt should rebuild our cities from the scratch or build new cities from the scratch. In the meantime all whiners should be charged for sedition to safegaurd the interests of our children……. You will agree with me that from last many decades the best , creative & brilliant minds stopped joining government services like BDA, BBMP, DDA,MDA,HDA or EB`s, CPWD/PWD`s, Mining & Geology dept, IAS/IPS cadre, KAS services etc etc as these jobs were made subservient to low quality greedy minds where you will be simply asked to BEND! Not bending would involve punishment. Politics did not want Best of Indian HR. The climate that has been created in Government services from past many decades are such it would discourage any creative and brilliant mind. from joining government services. It is well known that govt services have always been reserved for Indian HR which can dance like rubber toys. Still many brilliand minds did join govt services & did all they could. I have met many of them even to day who work in non decript govt departments who are not allowed to play any intelligent & creative roles! They are despised. Ministers shun them! With globalization & Technology offering better opportunities for creative minds, this tribe deserted govt services & went for globally employable jobs. Today only the left overs of the Indian human resources minus brilliant/better minds opt for government services which provides our basic day to day services. The results are there for all of us to see! Agaleekarana is one such result of low quality, bending minds who work for govt services. Happenings like Agaleekarana will be repeated in every govt service sphere! Keep watching! ‘The Castle’ which is telecast on Star Movies. It is an Australian movie about a family man living in the sub-urbs of a big city, adjacent to an Airport. He puts up a fight against the AirWays Company which has issued a notice of eviction to the residents for expanding the Airport. Is it a living room or a specific portion inside a house whose floor needs to be mopped? if it was then you could ask people to wait outside, move the furniture outside, have an empty floor , mop it and then call back the people inside. Building a city is not that simple. 2) When did the Middle class become architects of this city? In fact, residents opposed so many projects that were unnecessary, unscientific and badly planned ex: National college flyover, Tagore circle underpass…Contrary to your accusation of middle class, BBMP does not involve any residents group in the decision making process. 3) Haven’t you read the Reader’s letters to Newspapers – It is the common man who is most troubled by all this mess and writes letters to civic authorities about even smaller aspects like an unscientific road hump, a road hump needed elsewhere, about bus stops, dangerous electric wires etc. If the City planning authorities had respected the voice of the people then city would have emerged a lot different and better. 4) Watch ‘Mega Cities’ series on Nat Geo, episode on Paris. In that they show how the Paris city planners have created/managing an excellent sewage system, have laid optic fibre networks, telephone cabling etc… all this without disturbing a single of the umpteen historical buildings that dot the city of Paris. They have taken care not to have overhead cables that would disrupt the beauty of historical buildings and have laid them all underground. 5) Fly-overs are supposed to be signal-free, and ATMs were invented to address the queue build-up inside a bank; Probably ours is the only country where you see signals on a fly-over and queues in front of ATMs…another folly of middle class I suppose! 6) Kindly suggest which ‘class’ should be involved next in rebuilding our cities, and you could be the head of that project. I don’t know the background of your resentment towards Middle class but you are a class apart yourself! Suresh, very nicely written. Meaningful and sensible. Cheerio. In roads Vs trees, I want roads to win….. and I really don’t care about urban kerbside trees. 10 minutes I save in the commute time results in either ten minutes more in the office or 10 minutes more quality time(onemore useless middle class jargon) with my family. A trueblood angreze, like Lutyens….